@Cantonment | Get Your Grub On! More of that Caribbean feeling. I wanted to try out ‘Lime House’ since I had heard about it mainly because I didn’t have much of a clue what real Caribbean food actually is and so today I met two friends down here for an early lunch. It turned out we didn’t pick the best of days as they just had a big party the night before and ran out of the ‘Crab & Callaloo‘ (Crabmeat Dumplings) and the ‘Curry Goat‘ which I initially wanted to order but after a quick brainstorm shuffle I had my choices switched around and ended up having the ‘Red Snapper Eskovitch‘ as main. The extra thick fillet of fish had a nice curry like crust and was still perfectly moist and soft. The coconut cream was overly rich and creamy and the pickled vegetables even though a refreshing contrast seemed a bit out of place but in a nutshell it was still a tasty dish. As side I tried the ‘Fried Plantain‘, a cooking type of banana, that I really liked actually. It was slightly sweet, like caramelised and had a great firm bite, pretty starchy and oily but an awesome change for a side. The ‘Caribbean Fish Cakes‘ were also super tasty, very small but delicious. ‘Lime House’ is nice, nestled in between with the other shop houses on Jiak Chuan, using turquoise colours for that slight Caribbean feeling and serving up some things different. The food is tasty but nothing I’d necessarily crave for, however that ‘Curry Goat‘ has made me curious enough to come back soon and give it another shot. Restaurant week was back in town and for a change I didn’t sleep all through the whole show this time and even scored two dinner bookings which of the first was at ‘Hashi’s’. There were chilled soba to start with but I missed some grated ginger to pep things up. The noodles were followed by a Japanese salad with a wonderful dressing and a set of sashimi; amberjack, tuna and scallop which were of good quality and tasted fresh and nice. The main was a bento mix of all sorts of different stuff, some of my not so favoured seaweed, blanched spinach, unfortunate tough and greasy cold duck breast, a tasty and soft fried fish, good tempura but the best thing by far was the lovely piece of pork belly that didn’t really have very tempting looks but was amazingly soft and therefore I thought way too small. I also got to try the beef cheek from my friend’s bento which was super nice and tender but really became great with a tiny bit of this jalapeño pepper sambal they handed aside. The dessert was a sampler of two. I wasn’t a big fan of the red bean bars with chestnut and their super rich and filling character but the red bean and sake flavoured cake was actually quite good and interesting but nearly too small to really wrap my head around it and fully get the taste. I’ll probably never understand this red bean thing anyway? I liked ‘Hashi’s’ interior; minimalistic Japanese, simple and elegant in the front which unfortunately loses a dash of its’ atmosphere in the back room we were seated in. The food was good and there were many things to try, but besides the pork belly I was just hoping for some more extra specialness from their special menu. Vietnamese, my new after workout food. One branch of my yoga studio is directly next to this shop in Tanjong Pagar so it was just a matter of time until I would come by here for some after workout pho. I ordered their ‘Summer Fresh Rolls‘ as starters that were probably not super authentic but exactly how I like them, fully packed with greens, fresh herbs, prawn and instead of the so often weirdly grey pork they used chilled chicken breast. Light and fresh. 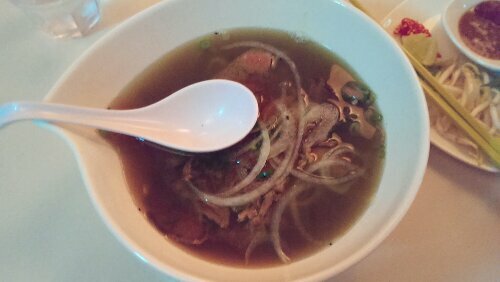 My main was set on ‘Pho Bo‘ with sliced beef which turned out to be quite tasty. The beef was lean and beefy, the noodles were ok and the broth had a decent flavour even that it wasn’t that strong. They provided some greens, sprouts and chilli to add to the soup but I just always miss the tables full of greens that I only found in Vietnam so far. All in all not bad and I am glad to have such a dinner option so close after a tough yoga class that I surely will “stop” by again some time soon.